Welcome to Waterscape A421! 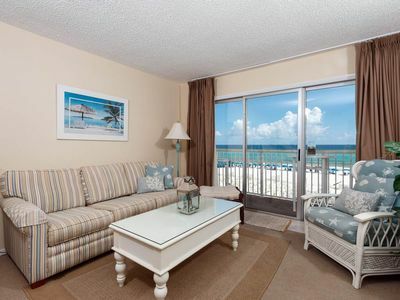 This is a 2 bedroom, 2 1/2 bath unit with a bunk room that sleeps 8, situated directly on the beach. If you have ever been to Waterscape, then you know how amazing the property is. If not, you are in for a surprise! There is a lazy river perfect for floating in the sunshine. No need to bring your own tubes as they are provided! There is a huge activity pool with beach entry, fun mushroom waterfall, and rope ladder attraction that will keep the kids busy for hours. While the kids are playing, relax under the 10' waterfall, soak in one of the 2 hot tubs, or hide in the cave. When lunch rolls around there is no need to leave. 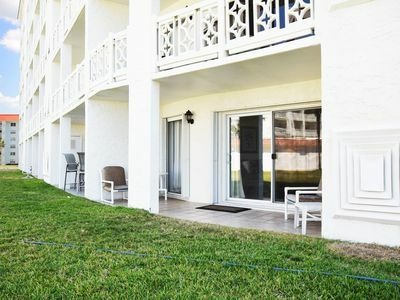 Use the numerous grills provided throughout the pool area or eat at the Tiki bar that serves up burgers and snacks. They also make some amazing cocktails ;) If you are wanting to escape the excitement, then proceed to the upper deck. There you will find a huge heated pool (heated in the colder months) where you can relax or sunbathe on a comfortable lounger. There is also a decked out splash pad for the little ones sure to entertain them in a safe environment. For adults that want to keep up their workout routine, there is a large fitness center with cardio and strength training options. 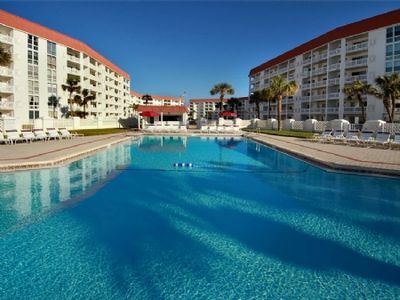 If the pool is not your scene, then the beach is right there! Waterscape is situated directly on the beach with no roads to cross. 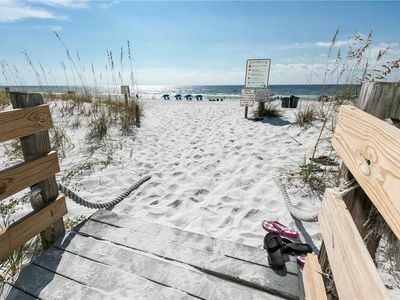 There is a newly built direct access walkover that can have your feet in the sand in under a minute! 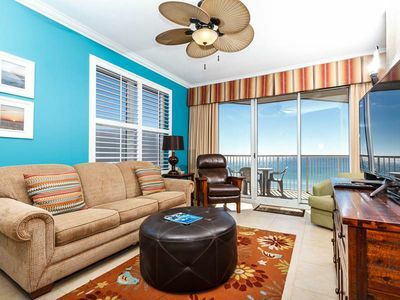 There are beach chairs, umbrellas, kayaks, and paddle boards that you can rent directly on the sand for a small fee. And when you are done, there are numerous showers to wash off and jump back in the pool or head back up to the condo for a siesta. 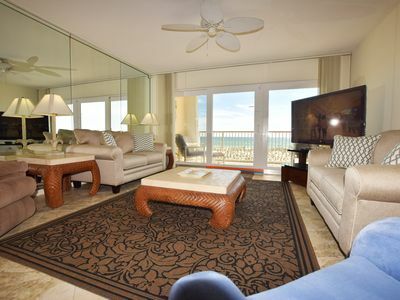 This is a 2 bedroom (king beds) , 2.5 bathroom unit with a bunk room (2 twin beds with a door). There is almost 1300sqft. 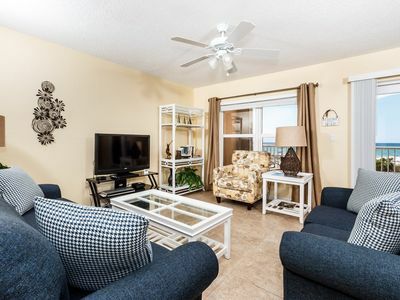 of living space which is exceptionally big for a 2 bedroom condo. 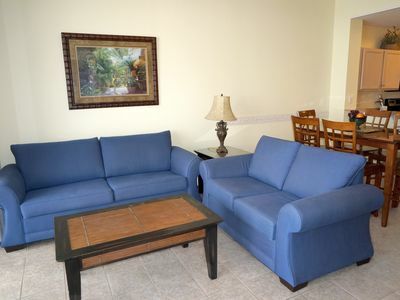 We are constantly updating the condo so you are comfortable and the place feels fresh. 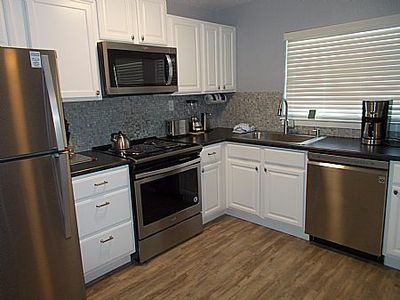 The kitchen has stainless steel appliances and granite countertops. 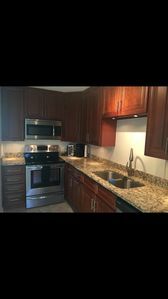 It has all the utensils and gadgets including a blender, coffee maker, Keurig, toaster, and hand mixer. There are 2 master bedrooms that each have a king size bed. They both have their own en suite and both have balcony access. I hate that when I travel with another couple, one of us always gets stuck with a tiny room or a hall bathroom. That is not the case with this unit! Both bedrooms are spacious and well appointed. One of the showers is so large you literally could fit the whole family in there! Lastly, the dining room table will sit 8 comfortably. 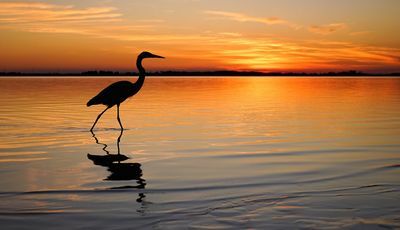 Now that you know that Waterscape is amazing, why choose our condo? 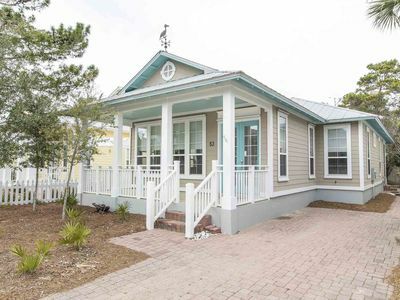 1st, it is completely updated with a coastal chic decor. It has all new furniture, matresses, and paint. 2nd, it has the rare BUNKROOM DOOR! We recently installed a bunkroom door that most units do not have. It lets the parents stay up and socialize without waking the little ones in the bunkroom. 3rd, this is a great unit if you want to enjoy all the amenities of Waterscape but don't want to pay the hefty price tag of a courtyard view. Half the units at Waterscape are courtyard facing and the other half are outside facing. 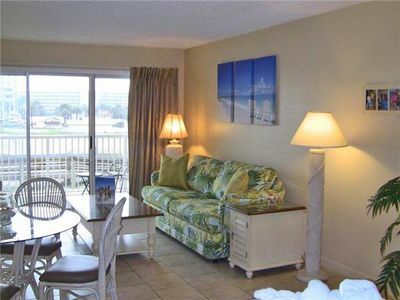 The outside facing units have a partial ocean view and don't face the pool. The newly constructed Hilton next door has blocked a portion of our view but the Gulf can been seen from the master bedroom and balcony. This is great for families that are not interested in spending more for the view but want every amenity possible! 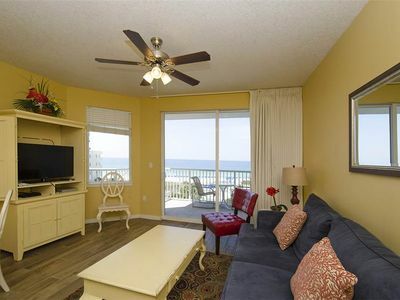 4th, we are perfectly situated between the parking garage and the beach, each being just a short distance away. If you park on the 4th floor, we are less than 70 steps from the garage! The trash chute is 35 steps from your door and the elevators down to the pool are less than a 1 minute walk. We do not have beach service with this unit. We decided not to purchase it because I have heard negative things about it. Most of the time there will be more than 2 people in a room so with the service only providing 2 chairs it either separates families or costs them an additional money to rent another set. Also, they pull the chairs up 2 hours before sunset which is really a nice part of the day if you want to see the sunset. We have a beach cart that you can use for your convenience and load up your own chairs. This way you can set up wherever you like, stay as long as you want, avoid the crowds, and have the freedom to take up as much space as you like. 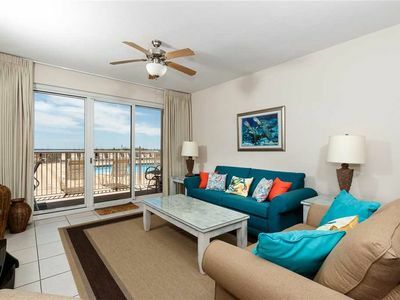 Also, I priced my unit as one of the cheapest so even if you added beach service, I'm still cheaper than most other units at Waterscape :) It can be purchased directly in front of Waterscape for around $20/day depending on how many days you purchase in advance. Please feel free to call or email with any questions. If you are ready to book, the easiest way is to click on the "book it" button close to the picture. I require half of the money up front to hold the room and the remainder will be due 30 days prior to your arrival. Please be sure you are committed to your dates because I have a 0% refund policy. If you think there is a chance you might need to cancel, you can buy a small insurance policy as you are prompted along the payment screen. 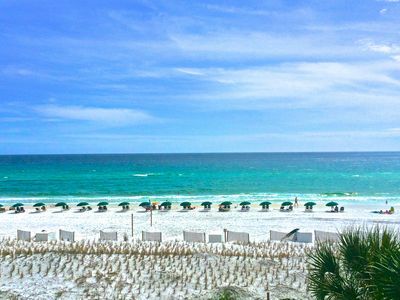 Waterscape is a gulf front water resort and the only property in the area with this level of amenities and 490' of private beach front. There is a spectacular split-level courtyard with an oasis of pools, one a zero-entry. There is a shaded play area with a rubberized mat for toddlers and children adjacent to a splash area filled with built-in water toys. Waterscape has 2 hot tubs, a 10' waterfall, and an incredible Lay-Z-River for floating. For active adults, there is a fitness center opened 24/7 with pleasing views of this tropical oasis. 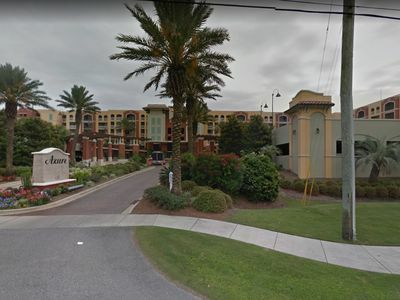 Our ideal location means you are within walking distance of many restaurants, shops, and entertainment. Old Bay Steamer is directly across the street and one of the best seafood restaurants around! Islander 2-2009 - Booking spring vacays, now! Azure 615 Sunkissed! Amazing Top Floor View! Booking Spring/Summer 2019 Now! 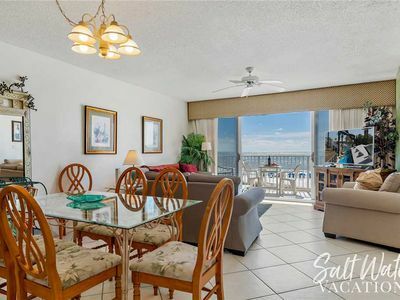 ENJOY your sunrises on the OVERSIZED balconies on the GULF!! Free Beach Service! 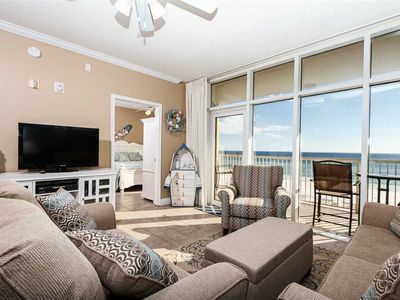 Beachfront Condo with Private Balcony. Master Bedroom with Views! 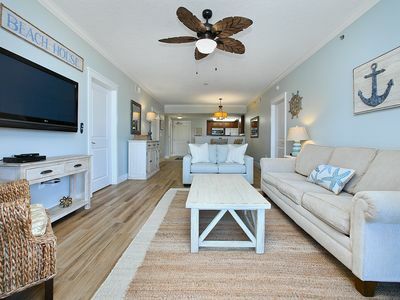 Private Beach Home in Seagrove Beach. Community Pool and Tennis Courts. Short Walk to Beach!